Aikido is a modern, non-aggressive Japanese martial art that was developed early in the 20th century by Morihei Ueshiba (1883-1969). In Japanese, Aikido means "the way of harmony with the force and principle of nature." Aikido is derived from Japan's traditional budo (the way of martial arts), yet goes beyond the realm of budo; it is a path where the keen edge of martial art is used as a "Way" to spiritual growth. On the technical side, aikido is rooted in several styles of jujitsu (from which modern judo is also derived), in particular daitoryu-(aiki)jujitsu, as well as sword and spear fighting arts. Oversimplifying somewhat, we may say that aikido takes the joint locks and throws from jujitsu and combines them with the body movements of sword and spear fighting. 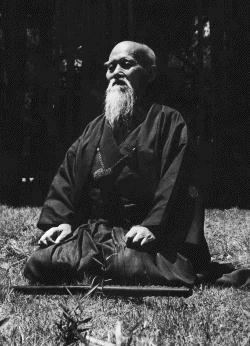 However, we must also realize that many aikido techniques are the result of Master Ueshiba's own innovation.The most outstanding feature of physical training found in Aikido is the repetitive practice of various motions known as kata (forms), until rational and unforced movement flows naturally throughout the body. By unifying body, mind and ki (internal energy), and by utilizing internal order together with physical balance, the hidden potential of each person may be expressed through the dynamism of technique. Using circular motions, Aikido harmonizes and neutralizes the aggressor's force. Training involves physical, mental, spiritual and ethical disciplines. It includes empty hand techniques, sword, stick, and knife defenses. Unique among martial arts, Aikido minimizes the need to maintain control of situations.The fact that there are no competitions in Aikido is a logical conclusion of its philosophy. Since winning and losing are never a concern, the trainees are free to dedicate their efforts to mutual goals. It is therefore possible for men, women, and children of all ages to walk together down the path of budo, the heart of Aikido. Each individual trains and progresses at his or her own pace, finding harmony through personal development. Regular practice brings a sense of well being and self-confidence that permeates all aspects of daily life. As people with varying personalities and life styles come together for practice, they gain concrete experience in reconciling different points of view. In Aikido, there is no "Way" except the path of confronting "the enemy" that lies within oneself. Aikido is a path of dogged perseverance and dedication to improving both spirit and body. The recognition and acceptance of this aspect of training are the surest means of consistent personal development. Aikido's founder, Morihei Ueshiba, was born in Japan on December 14, 1883. As a boy, he devoted himself to hard physical conditioning and eventually to the practice of martial arts, receiving certificates of mastery in several styles of jujitsu, fencing, and spear fighting. In spite of his impressive physical and martial capabilities, he felt very dissatisfied. He began delving into religions in hopes of finding a deeper significance to life, all the while continuing to pursue his studies of budo, or the martial arts. By combining his martial training with his religious and political ideologies, he created the modern martial art of Aikido. Ueshiba decided on the name “Aikido" in 1942 (before that he called his martial art "aikibudo" and "aikinomichi"). Aikido is both a martial art requiring physical mastery and spiritual discipline to develop mastery over self. We learn to respect others through mutual physical practice. In this way, a means of communication is established which transcends the barriers of lifestyle, language, culture, and race. Aikido, as a martial Way for all people, is like a compass which directs the completion and unification of each person's body, mind, and spirit with the fundamental and creative spirit of the universe.